Ahmad is assistant professor at the University of Lahore in Pakistan, and Secretary-General of the International Movement for a Just World. Ahmed states that he has seen similar reports in Pakistan charging some U.S. backing of ISIS in Afghanistan. See Ahmed’s recent interview on The Real News. 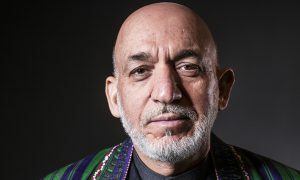 In 2009, Hoh resigned his position with the State Department in Afghanistan in protest of the escalation of the war there by the Obama administration. See 2009 Washington Post piece about Hoh: “U.S. official resigns over Afghan war.” He previously had been in Iraq with a State Department team and with the U.S. Marines. He is now a senior fellow with the Center for International Policy. As noted in leaked American intelligence documents and through the reporting of many and varied journalists over the last six plus years, the United States funded, supplied, armed and assisted, directly and indirectly, many jihadist groups, including ISIS in the early years of the Syrian civil war. American allies, including Israel, still support these jihadist groups directly in Syria, as well as Yemen. It would be naive, based upon decades of American covert actions and wars, to imagine the U.S. is not involved and complicit at some level with that support in these multiple countries, even if it is just approval from senior officials in Washington, DC.